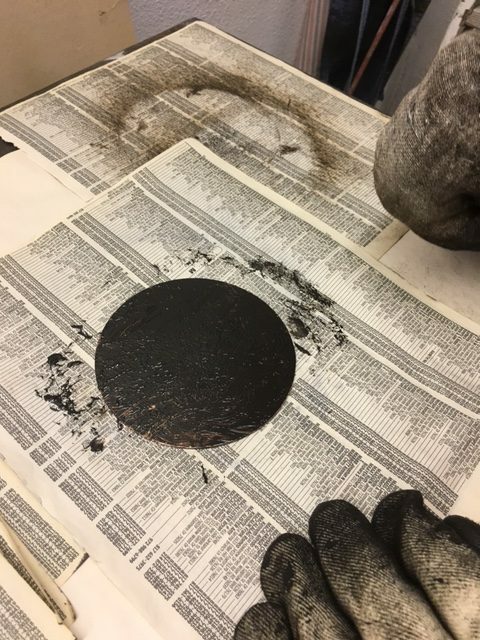 A few months ago I had the good fortune to be able to “audit” a workshop on making a lithograph. The workshop was given by David Conn for the Docents of the Amon Carter Museum in Fort Worth. 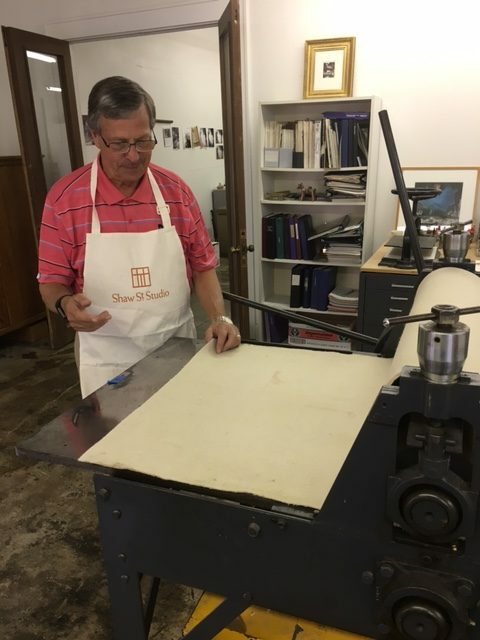 It was held at the The Shaw Street Studio Fine Art Press. David is the founder. Seeing the press gave me an idea. I had copies of about 1/3 of my Dad’s etchings as prints. 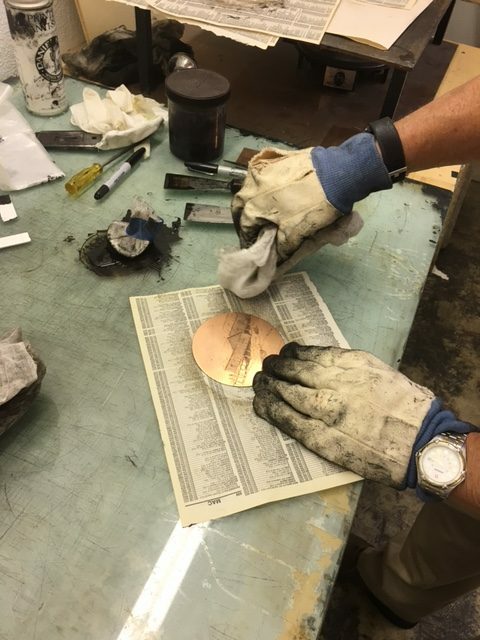 However, when my Dad passed away, my brother and I found all of his etching plates. He and I split the plates so that we could share in the enjoyment of my Dad’s art. Wouldn’t it be great to have a complete set of prints? 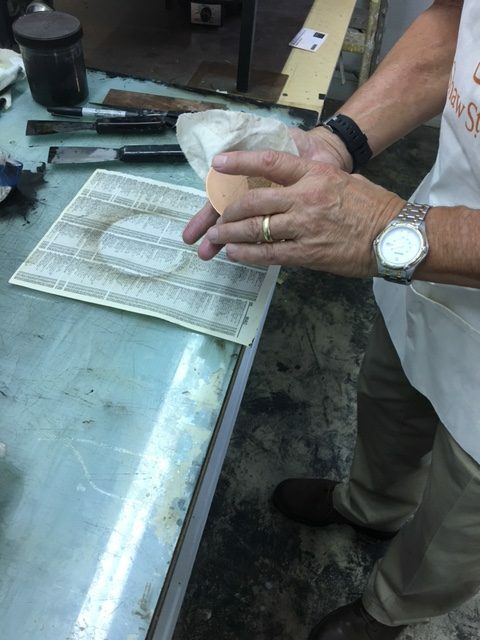 So, I asked David if he would be interested in being the printer for this project. Thankfully, he said yes. I asked my brother to send his half of the plates to Fort Worth. David and I negotiated a fair price for the project which consisted of two etchings from each plate. My Dad did a total of 55 etchings. My brother and I finally had a way to have prints of all 55. 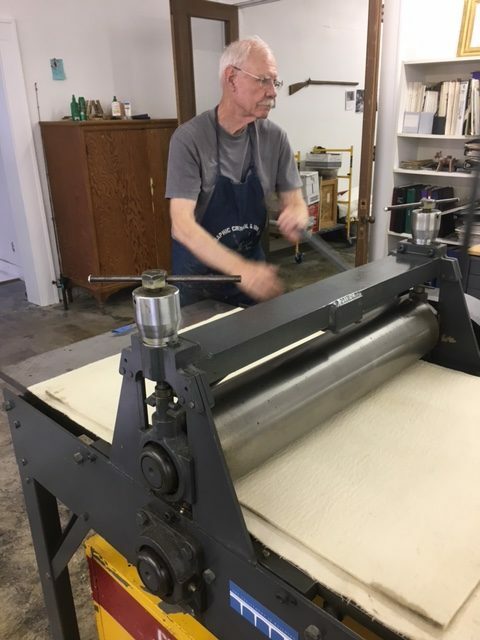 David was under some time constraints because he had sold the Sturges press to an artist in Austin. 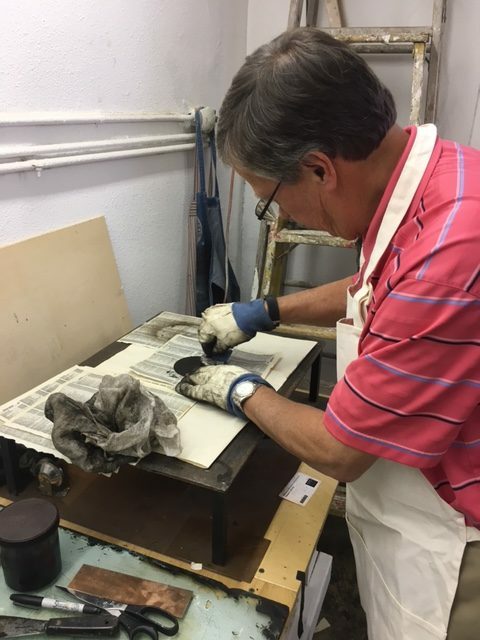 I had hoped to spend some time in the Studio as David was printing the etchings. However, due to our conflicting travel schedules, we were unable to arrange for a mutually agreeable time to meet. 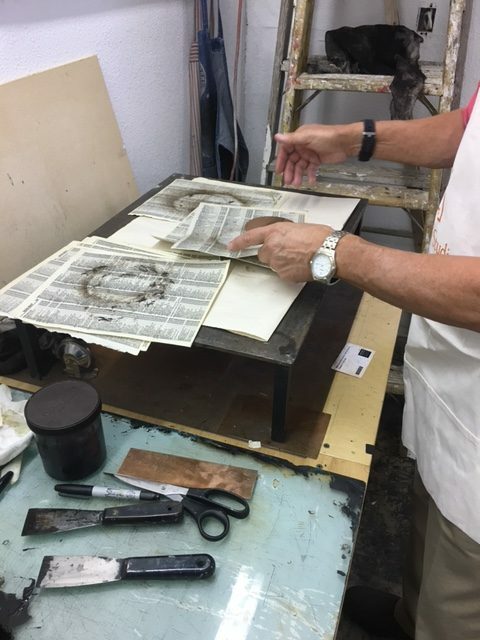 After a few weeks, I received an email from David – the etchings were completed and I could pick them up. While I was at the Studio looking at the etchings (they are beautiful! ), David mentioned that he still had the press. The purchaser was figuring out the logistics of moving the press. Since it weighs 1,700 pounds, loading it on the back of a pick-up truck was not going to work. 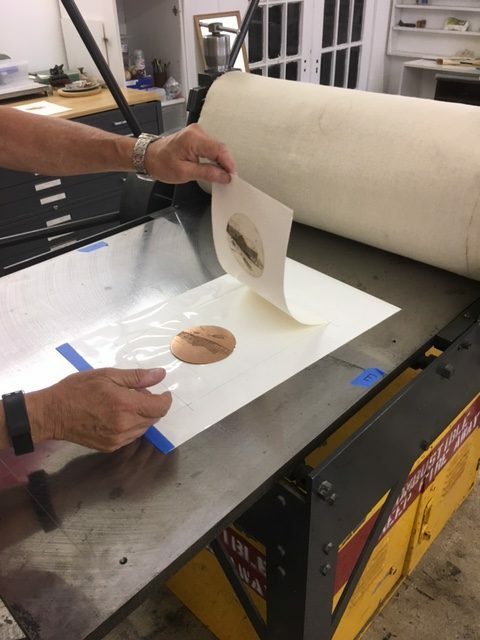 So I asked if David would be willing to print a few more etchings of one the plates with me as an observer and photographer. “Sure, how about Thursday afternoon.” And now the story gets even better. I arrived at the appointed hour wearing my usual work attire – khaki slacks and a golf shirt. David suggested I might want to wear an apron. He just happened to have an extra “Shaw Street Studio” apron for me. David had wetted 4 sheets of paper. 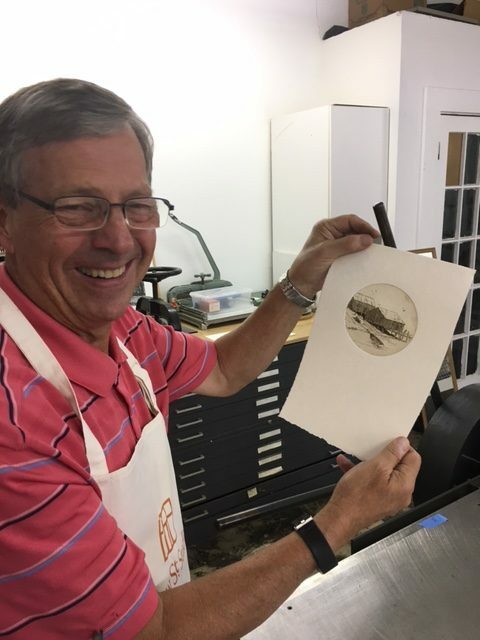 I observed and photographed happily as David printed two etchings. Then he asked me if I would like to print one. With some reluctance I said yes. So I inked, wiped and heated the plate. 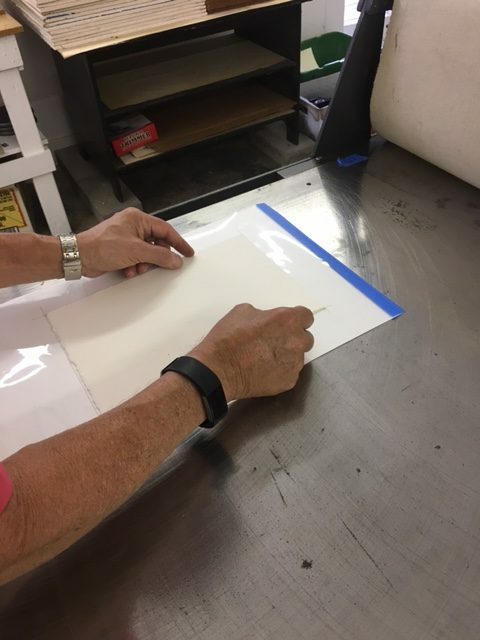 Then I placed it on the pre-prepared template on the press bed, laid the paper on top and ran it through. I have to admit I was worried about how it would turn out. To my amazement – it was a rich, clean impression – definitely a keeper. David then said: “We have one more sheet of paper, would you like for me to print it or would you like to do another.” No hesitation this time. “I would like to print another.” was my reply. 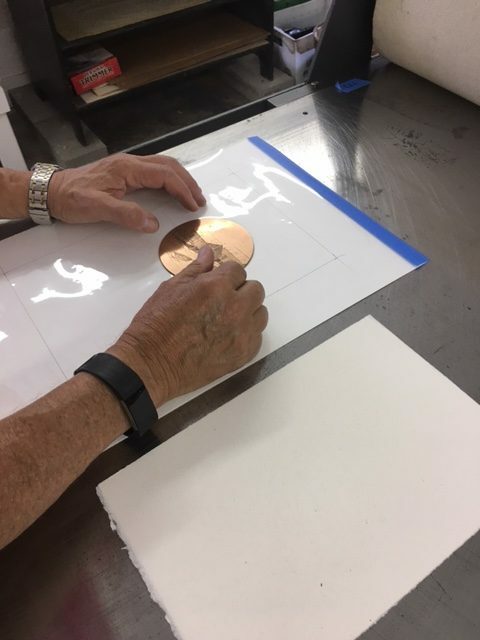 So, the following is a step-by-step process of printing an etching. Printing by Jim Rosenthal. 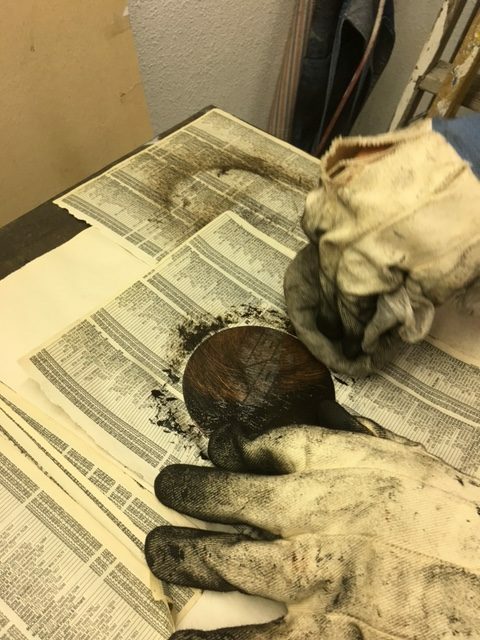 Photographed by David Conn.
“Pulling the Print” through the press. 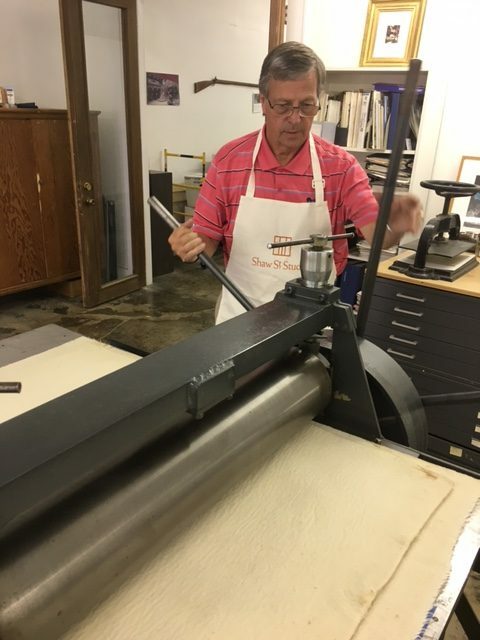 The Sturges Press is a fine piece of machinery. It is solid and smooth. David recently retired as a Professor of Art at TCU. I envy his many students. He is a gifted teacher – knowledgeable, supportive and patient. I am very fortunate that our paths crossed for this experience.